Although your local OSHA (Occupational Safety and Health Administration) may not have IAQ (Indoor Air Quality) standards yet. Still typically OSHA does have standards about ventilation and standards on some of the air contaminants that can be involved in IAQ problems. complying with environmental regulations, managing air emissions to reduce company’s carbon footprint. CSR (corporate social responsibility) is a form of self-regulation on environment, consumers, employees, communities, and the public sphere. ESG (environmental, social and governance) covers sustainable, ethical and corporate governance issues. Both of them are about sustainable corporate governance, and driving forces to make cleaner air to all stakeholders. In January 2017, China released a new indoor air quality index reportng system (IAQI), in its heathy building certification scheme 《健康建築評價標準》 T/ASC 02-2016, which demands daily and hourly averages on a host of air quality parameters: PM2.5, PM10 and carbon dioxide. Getting accurate, up-to-date information about air quality for public health research can make a difference for people living with lung conditions such as asthma and chronic obstructive pulmonary disease (COPD). Your organization will be respected if voluntarily setup a public signage showing IAQ in your managed premises. You empower people’s right to know, add value to your real estate, & visualize your competence of offering healthy indoor air. WOOFAA Air is a wireless ambient air quality monitoring system with internet-of-things (IoT) functionality. The system is developed cored from a sensor edge device the WOOFAA Dog. Zetakey, one of the leading IoT middleware developers in Hong Kong, is showcasing WOOFAA Air as one of their IoT solutions to corporate clients. Zetakey in show to demostrate how Intel-based Universial IoT Gateway can be deployed to form a IoT network, adding value to business in general. Besides using WOOFAA Air for public signage, it can be used for facility management as well. We have made standard software modules for multi-site, multi-user and sophisticated alert management functions, making WOOFAA Air an excellent tool for preventive crisis management in public organizations. WOOFAA Air comes with a simple and intuitive user interface for fastest project deployment, making it an affordable system to every organization big or small. The WOOFAA Team is well versed in big data analytics. Therefore we are very supportive for bespoke need of infographic visualization, creating static or dynamic charts and environmental heatmaps on project basis. New World Development, one of the largest property developers in Hong Kong, has deployed WOOFAA Air in its headquarters building the New World Tower. Real-time IAQ measures are shown in public areas as a value-added service, telling building occupants to feel safe staying longer. WOOFAA Air’s user interface on signage can be custom-made to fit your need, such as this Daikin shop who needs to illustrate functionality of their dedicated outdoor air system (DOAS) embebbed with a heat exchanger, working in reverse mode over Summer and Winter seasons. Use of WOOFAA Air is not limited to MNC or public companies. It is made to be a simple and affordable system to any organizations who care to know what they breathe at work. 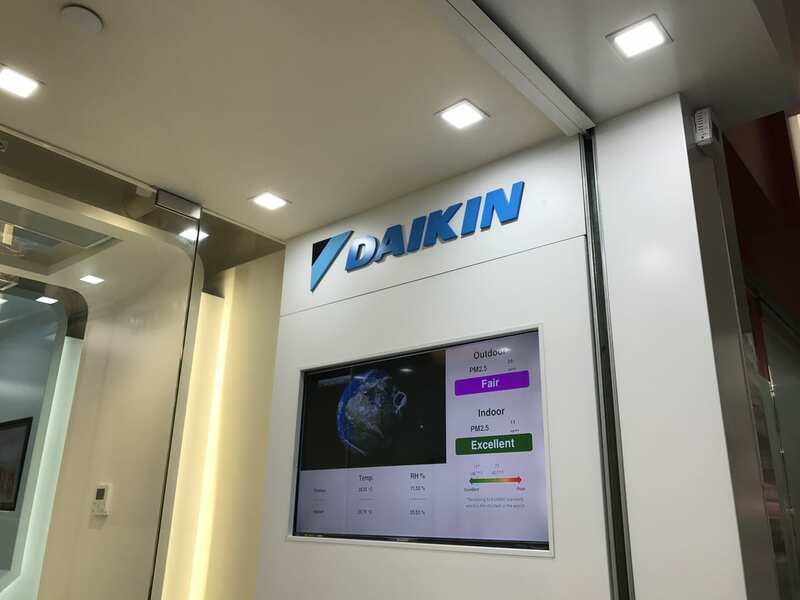 Daikin, one of the largest air conditioning equipment manufacturers in the world, is using WOOFAA Air in some of their pro shops to visualize how capable their equipment are to protect people in indoor from outdoor air pollution. An air quality monitoring device on multiple air pollutant types. WOOFAA Air is scaleable from one Dog, to a couple hundreds within a network. As the Dog runs on wireless Zigbee not much electrican work is requuired. Your network can be expanded in phases. A Linux machine with custom-made middleware managing data flow from our Zigbee air sensor mesh to cloud server. DELL for hundreds of nodes. Standard or bespoke to your project. We are using HTML5 technology which allows better fluid animations, stream video, play audio, create high-quality drawings, charts, and embed Social Network sites like Facebook and Twitter into the interface. For sensor data hosting and system data management. To develop new services for smarter environments, data gathered need to be stored, processed and correlated to different pieces of information. This is how you get long-term value of WOOFAA Air.